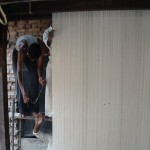 tradition of weaving using a rod was developed in Nepal. 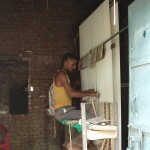 In this case a loom would be strung with the cotton warps, in the same way as for conventional knotting. 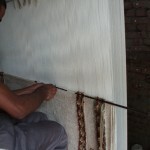 A rod would then be threaded between the warps. 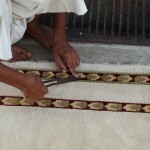 The thickness of the rod used, would determine the size of the knots, in turn dictating how fine the finished rug would be ie. 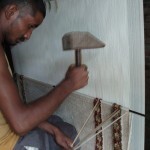 The thinner the rod, the finer the knotting. 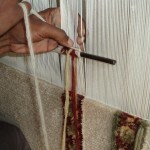 The wool is then wound around the rod, colours being carefully placed according to the naksha, before being sliced through and the rod released. This is a much faster technique than conventional knotting, but produces quite a different look. 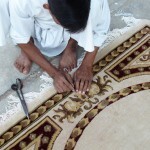 The surface will appear slightly textured with a ridge affect running through the rug. 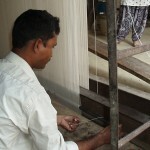 Again once the weaving is completed, the rug is cut from the loom and sent for washing.